Carmarthenshire Fungi: Giant Puffballs in Trimsaran. This photo was sent to our "Wildlife Watch" page, last night. A friend of mine had found them in a field in Trimsaran, Llanelli. 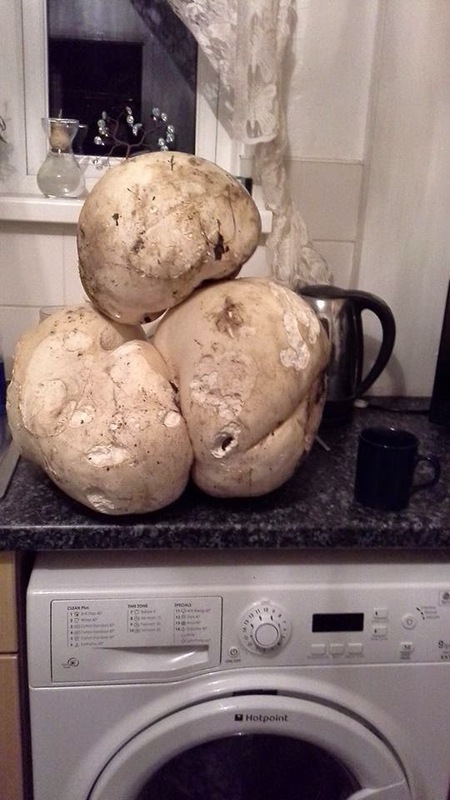 Believing that the white mass on the ground was an injured horse, he rushed to help only to find that it was an enormous cluster of Giant puffballs! This is just a tiny part of the cluster. My friend made Puffball Fritters for breakfast this morning but I suspect that they'll be eating these for many days to come. I remember having bacon and sliced puffballs, also from near Trimsaran/Llandyry, for breakfast in c 1975! The late Noel Tallowin - an able mycologist/naturalist who lived at The Moat, Llandyry showed me them. You`ve got me thinking of food now! This brings back memories ---- Noel dumped one of the large Giant Puffball (Calvatia gigantea) on my front door step, 1975. These were from a field on the Trimsaran- Kidwelli road and looked like dead sheep scattered about. It would be good to know, if possible, where these recent ones were found as could be same location. The fruiting is at intervals of years as the fungus gathers nutrients until conditions are right. I found a giant puffball in a field near Tregyb Wood, Llandeilo a few years ago. Been back regularly - never seen it since. This is a great photo.